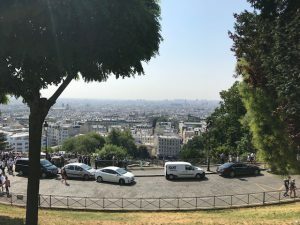 On July 12th, Thursday, we took a trip to Montmarte and the Trocadero! 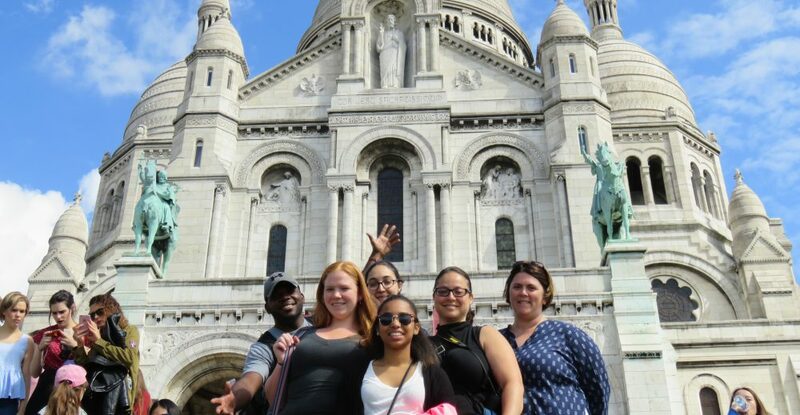 Montmartre is located in the north of Paris, which today is a more economically disadvantaged region of Paris. Montmartre was for a very long time not a part of Paris, and still even today it feels as though it is mostly on the outside of the city. 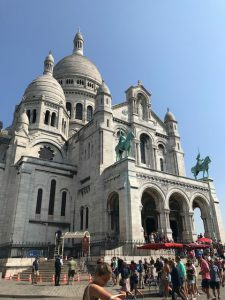 Montmartre as we discussed, was where many of the American writers of the 1920s, usually referred to as “The Lost Generation” gathered to live because it was inexpensive and because traditionally Paris is where artists go to flourish. 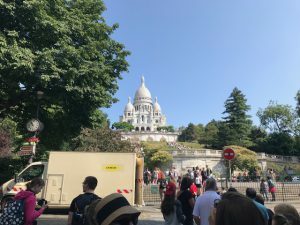 As we walked towards “Le Sacré-Cœur” the enormous church that sits on top of the hill of Montmartre, the view of the city of Paris below began to become better and better. The church itself was beautiful on the inside, and there was actually a mass going on while we were inside which was really interesting to see. 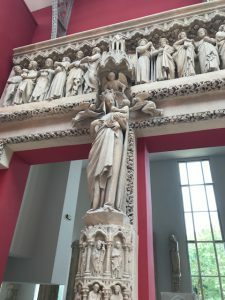 In all of the times I have been fortunate enough to travel to Europe and see these great churches, I have never been inside of one while a mass was in session. Once we climbed the many stairs and hills to get to the top, the view made it worth it! After visiting “Le Sacré-Cœur” we headed to go eat at the restaurant from the movie we watched for film class “Amelie.” Amelie is a very quirky, French movie, that draws inspiration from George Meiles’s “A Trip to the Moon.” In the movie, Amelie is a woman who begins to attempt to make the lives of the people around her better and bring them happiness. 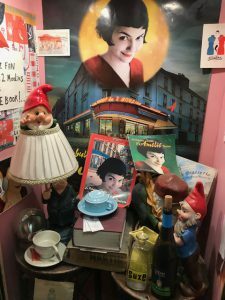 In the movie, she works at a restaurant, and we ate at that very restaurant today, Cafe des 2 Moulins, which was really cool! 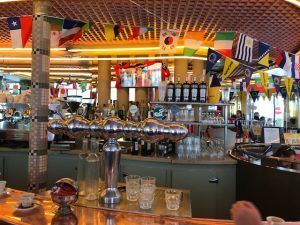 After the restaurant we headed to the Trocadero, the area of Paris where you have a direct and very clear view of the Eiffel Tower. 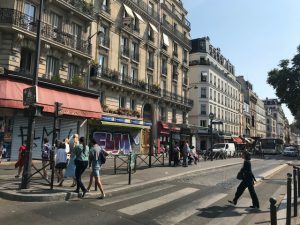 Unfortunately for us, there was a special filming of Mission Impossible: Fallout with Tom Cruise, and we could not access the Trocadero like normal. 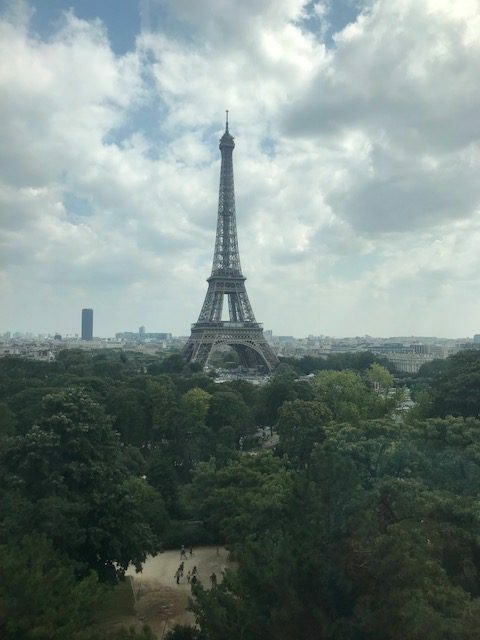 However, despite this, the Trocadero museum itself offered great views of the Eiffel Tower as well as a fantastic tour of the museum of monuments and architecture. We learned about the Romanesque period of architecture and its transition into Gothic art. This was most notably shown through the transition into using “flying buttresses” like on the Notre Dame cathedral. 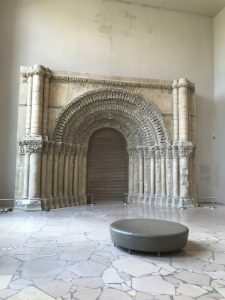 Also on this tour I got to see architecture from the Notre Dame d’Amiens which when I first learned about art history and architecture we spent a lot of time discussing because it was one of the first buildings to really show this transition, so seeing parts of that in person was really cool for me! In general today was a really interesting day packed with a lot of different things that we got to see around Paris. Of course, finishing the day at the Trocadero it is only right that I have to post a really great photo that I managed to take of the Eiffel Tower. I look forward to the rest of the trip!